Mohamed ElShorbagy (l) and Sarah-Jane Perry. The Oracle NetSuite Open trophies will have two new names engraved on them after Egypt’s Mohamed ElShorbagy and England’s Sarah-Jane Perry both claimed their first titles Saturday night in front of a capacity crowd at Justin Herman Plaza, San Francisco. The women’s final opened proceedings on the Oracle NetSuite Challenge Court between Perry, the 2015 finalist three seed, and two seed Nicol David, who was making her final debut in San Francisco. It was David, the eight-time world champion, who started on the front foot in the first two games, winning 11-8, 11-8. Perry fought back to win the third 11-7 and held two game balls in the fourth, which David fought off to earn a match ball for herself. Facing a match ball, Perry pulled off an irretrievable cross court nick and and pushed ahead to win the fourth 14-12. Perry earned an early lead in the fifth, which she maintained until she clinched the title 11-7 after seventy-four minutes. The $50,000 title is the largest of the twenty-seven-year-old Englishwoman’s career to date, and one that carried an extra emotional weight. 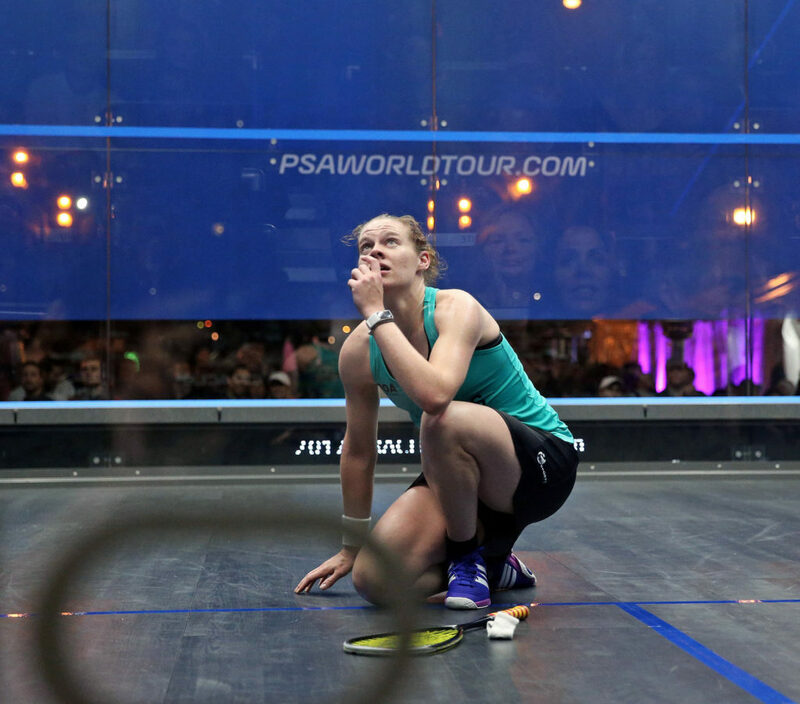 After clinching the title, Perry knelt down and looked up to the sky in remembrance of her grandmother. Perry, world No. 6, spoke of the respect she has for David, the sport’s most decorated woman. On her way to the final, Perry, defeated Hollie Naughton, Donna Urqhuhart and upset fellow Englishwoman and defending champion Laura Massaro. The ensuing men’s final saw two Egyptian teammates pitted against each other in the form of one seed and reigning men’s world champion Karim Abdel Gawad and world No. 3 Mohamed Elshorbagy. Both players were making their debuts in San Francisco this week and endured five-game semifinals Friday night. ElShorbagy edged an early lead 11-9 in the first, and stormed through the rest of the match to claim the title 11-6, 11-3 in forty-five minutes. 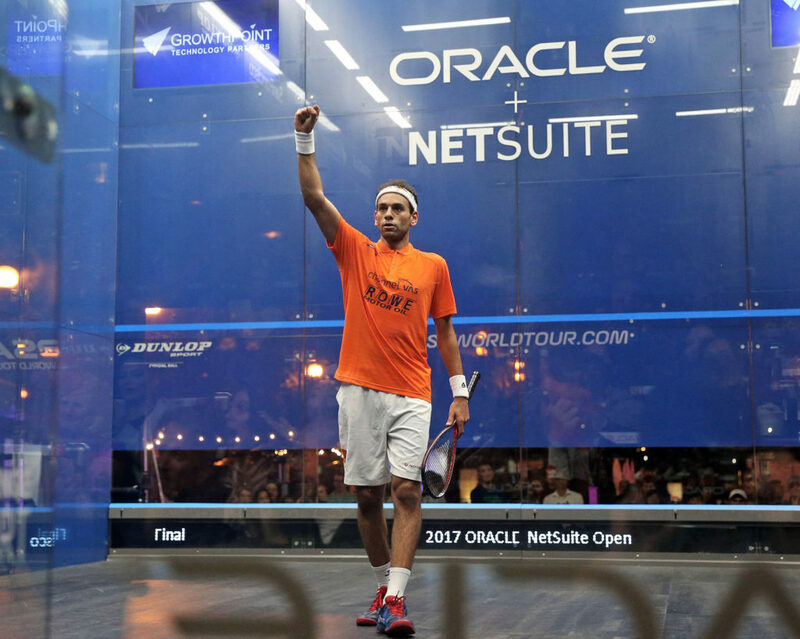 The 2017 Oracle NetSuite Open title marked ElShorbagy’s twenty-sixth career PSA Tour title. The twenty-six-year-old based in Bristol credited his title success to working with former world No. 1 David Palmer in the month leading up to the tournament.